This is quite honestly the easiest & fastest way to sharpen any knife. Average sharpening time is 1 minute or less. The basic kit consists of 2 precision-turned paper fiber wheels, each 8" in diameter and 3/4" thick. One wheel is coated with a silicone carbide abrasive, and buffing compound is applied to the other wheel. To use, sharpen the blade initially by using an equal # of passes on each side of the blade until a distinct burr appears the full length. Next, remove the burr on the slotted buffing wheel. Buff in the manner as originally done on the sharpening (abrasive) wheel. When using either wheel, copy the initial angle of the knife's edge. When you have completed both steps, you will have a razor-sharp edge on your blade. The time this edge lasts is indicated by the quality of the blade and steel. The system is shipped with both wheels & extra abrasive and buffing compound. The wheels are drilled for a 5/8" arbor size, and we include adapters to take that down to 1/2". The wheels mount on a standard 6" bench grinder motor. 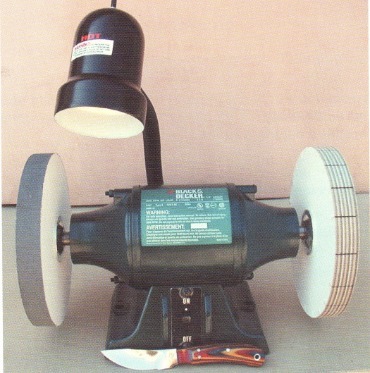 RPMs should be 3000 or more - most 6" bench grinders are between 3400 - 3650 RPMs, which is ideal. Once you use up the abrasive & buffing compound that comes with your initial kit, we sell each separately. We recommend that you not order extra when you purchase the Sharpening System. Most who do so lose it before they need it; you get enough with initial kit to sharpen 300-400 blades. Please call to order extra abrasive or buffing compound at $8.00 each, plus S/H. 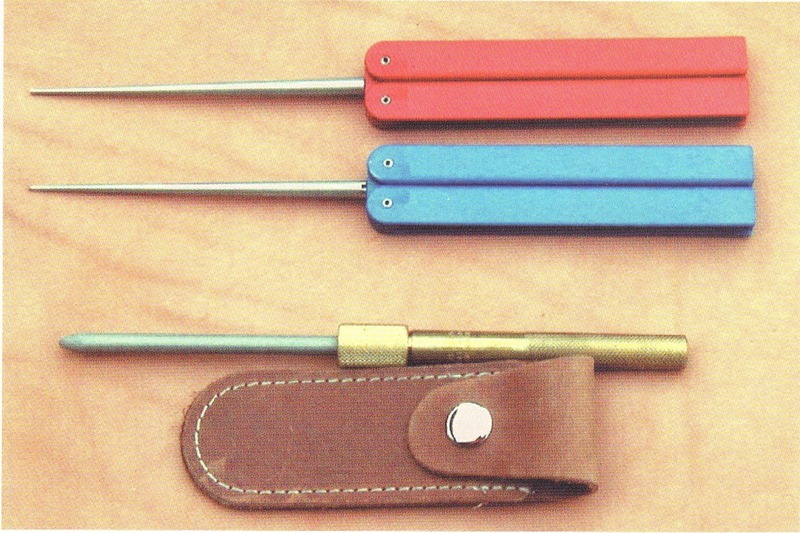 The collapsible, tapered sharpeners (top & middle) have tapered diamond steel and are available in fine (red) grit or coarse (blue). Great for use on serrated knives. The EZ Lapp Diamond Steel (bottom) is great in the field. This steel is a compact size and stores neatly in its own leather sheath.